The first thing you reach for when planning a walking day is the map. And it’s the first thing you put in your rucksack. 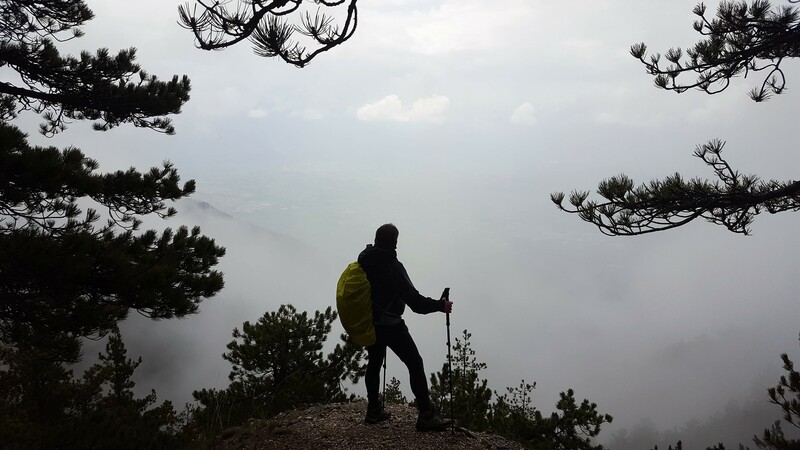 I’m often asked about those that should be used for walks in the Sulmona valley so here is a summary of what you should know. The chances are that where you live there is a comprehensive and up-to-date set of paper maps (1:25000 and 1:50000 scales) that are easily available and have been designed specifically for outdoor activities. But, sadly, not if you live in Italy. …the 1:25000 map of the Sulmona valley hasn’t been updated since 1956 and the 1:50000 one since 1993. Both are out of print and very difficult to obtain locally. In fact, truth be known, they are of no practical use to us walkers at all. However, all is not lost! 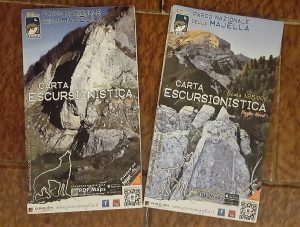 Two other organisations stepped up to the challenge and have produced maps specifically for walkers that cover most of the routes in the Sulmona Valley Walks catalogue. 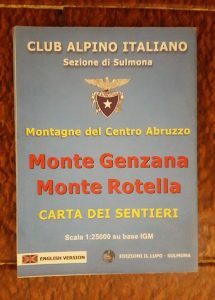 A big hand, please, to the Sulmona section of the Italian Alpine Club (CAI) and to the Maiella National Park authority. CAI, in association with the cartography house, Edizioni il Lupo, have produced a map of the southern part of the Sulmona valley that includes the lines of all of the footpaths they officially recognise and, in some cases, have waymarked and maintain. The map is called “Monte Genzana / Monte Rotella” and it is at 1:25000 scale. It is based on the 1956 IGMI mapping but, despite the fact that some newer minor roads are missing, it works well – not a lot has changed up on those hills! The map is easily obtained in Sulmona at the Tourist Information Office on Corso Ovidio and at Susilibri on Via Mazara. You can buy it online too at http://www.edizioniillupo.it and they’ll post it anywhere in the world. It also features a descriptive introduction to all of the main villages in the valley – in English as well as Italian! Secondly, in 2016, the Maiella National Park authority, in conjunction with cartographers D.R.E.Am, did a wonderful thing when they published their new two-sheet map of the Maiella National Park at 1:25000 scale. Called the “Carta Escursionistica”, this is a great pair of maps that are accurate, easy-to-read, beautifully produced and designed specifically for walkers. And fortunately for us they cover all of the walks on the eastern side of the valley. Though the base mapping is still the old IMGI data, the marking of the recognised footpaths is right up-to-date. The design is very good indeed and surely shows the way for how future maps of the region should be produced. The map is easily obtained in Sulmona at the Tourist Information Office on Corso Ovidio and at Susilibri on Via Mazara. You can also buy it in the Maiella National Park shop at the side of the steps up to the Rotonda on Corso Ovidio. Not yet online, though! But that, I’m afraid, is your lot. It leaves the north-western quadrant of the valley and a number of our routes without any paper map. There are, though, two very good fall-backs in the form of Google Maps and ViewRanger – digital mapping apps for your PC, tablet and smartphone. The coverage of both systems is comprehensive for the Sulmona valley and a number of views of the underlying mapping data are available – simple topographic, satellite imagery, street oriented, cycle path oriented and physical. A number of these views show footpaths well. I recommend you install both on your smartphone. They will compensate well on routes where there is no paper map and act as a very useful back-up for those that are covered by either of the maps discussed above. In addition, of course, an app with a digital map on your GPS smartphone, like ViewRanger, offers the very considerable advantage of being able to show you the line of your route and your position on the map – see the blog post, GPX Files and What To Do With Them, for details of gpx files and all they entail!